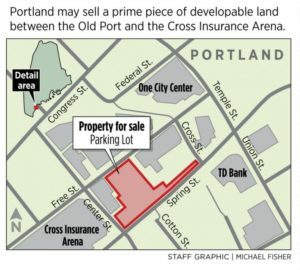 Portland may sell a downtown parking lot between the Old Port and Cross Insurance Arena under a deal being negotiated with a downtown developer. J.B. Brown & Sons is looking to buy the 175-vehicle parking lot that sits between Spring and Free streets. The sale would allow the city to acquire two parcels of land owned by J.B. Brown needed to complete the relocation of the city’s Public Works Department to Canco Road. The city would net nearly $1.2 million under the proposed sale, while generating roughly $35,000 a year by returning the publicly owned land to the tax rolls, according to a memo to city councilors. Mayor Ethan Strimling said he asked that the proposed sale come before the City Council for a workshop, so the public could learn about the proposal before the council’s Economic Development Committee holds a public hearing. “This workshop is really for me to get a better sense about what the deal is and give the community an opportunity to provide some input,” he said. The lot was acquired by the city years ago through the Urban Renewal program, according to a memo to the council. 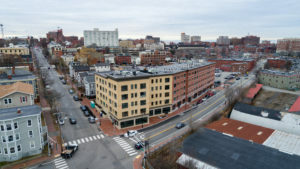 Federal funds were used to buy the lot and J.B. Brown has been leasing the land from the city to operate a surface parking lot. The company splits the parking revenue with the city, which uses its share to supplement its Community Development Block Grant program, which funds services and projects in low-income neighborhoods. Parking revenues have generated nearly $1.7 million for the program since 2007, or roughly $100,000 a year. Strimling said he is concerned about losing that block grant funding, which is mostly composed of federal funds. Last year, Portland’s CDBG budget was $1.7 million. J.B. Brown has the inside track on the land because it owns property on both sides of the parking lot, as well as an access easement through the property. “J.B. 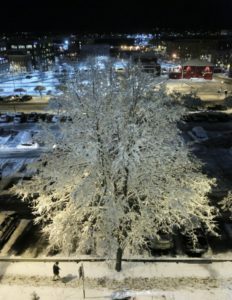 Brown is the logical buyer for the city-owned surface parking lot for the city to realize maximum sale price,” Economic Development Director Gregory Mitchell said in a memo to the council. The transaction would allow the city to finalize its long-term goal of relocating the Public Works Department out of the Bayside neighborhood, freeing up about 4 acres of land for redevelopment near the downtown area. The city originally proposed swapping land at 1 Cambridge St. near Morrill’s Corner with J.B. Brown in exchange for two parcels abutting its recently acquired land at 250 Canco Road. But J.B. Brown President and CEO Vin Veroneau said the land it would have acquired in that deal turned out to have environmental issues that prevented it from being developed. The parcels the city is looking to acquire are valued at $295,000, while the city land is valued at nearly $1.7 million. Mitchell said in his memo that the city is proposing to sell its land for nearly $1.5 million, since J.B. Brown has been allowing the city to use its Canco Road land for the city salt sheds while continuing to pay property taxes. Another $88,000 was knocked off the value to account for the easement that the company holds on the parking lot. Veroneau said the company bought the city block from Cross Street to Center Street in 2015 for nearly $7.2 million. He said the company probably would continue operating the parking lot in the short term. “At some point we would like to develop it,” he said.